*in case you did not know, n'ice cream is short for nana' (aka. banana) ice cream. it is the best. Anyway! Welcome to this short and speedy post. I am currently sitting in a hotel room in my last few days of Cyprus so I am dying to get back out into the sun. 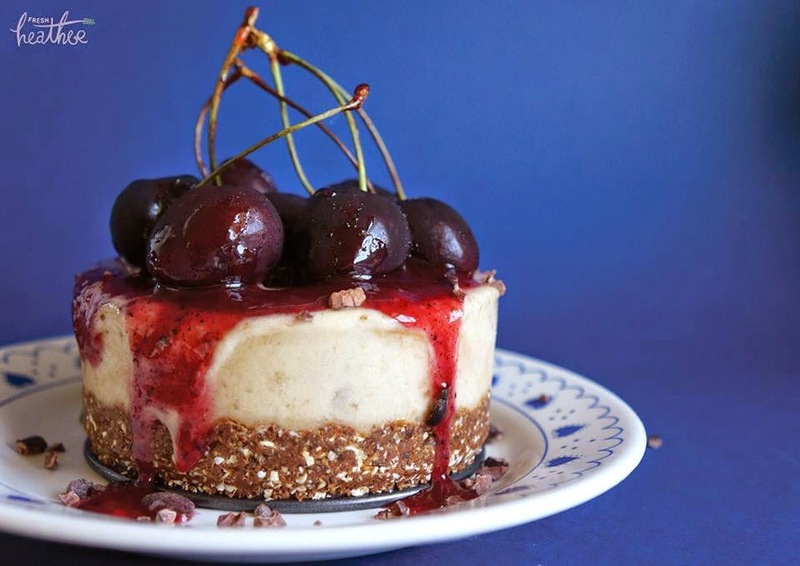 I thought I should probably do a quick post with the written recipe of my 'n'ice cream cheesecake' which has now been on my youtube channel for nearly a month (...i'm quite behind on my blog at the moment)! 1. Break up the squarebar into pieces and blitz in a food processor along with the oats. Add in the two pitted dates and blitz until mixture clumps together. 2. Press into a mini cake tin (mine was 10cm in diameter and this gave a thick base but you can always use a larger tin). 3. Slice the frozen bananas and place in the food processor along with the vanilla and a splash of almond milk (I needed 1tbsp ish). Blitz until smooth and creamy. 4. Spread the banana 'ice cream' over the base. Sprinkle the contents of an Acai capsule on top and mix in (this part is optional but I like the flavour it adds). 5. Place in the freezer for 2-3 hours. 6. Take out just before serving and top with fresh cherries, cacao nibs and a compote (I combined 1tbsp cherry jam with equal parts hot water and 1 acai capsule). - adds a nice extra berry flavour (as well as a superfood burst: high in antioxidants + beneficial for the skin and body) - is not a necessity in the recipe. - this one is kind of a necessity as it is one of the main ingredients but if you can't get a hold of them, replace with another (50g) protein/energy bar (i will also leave an alternative for completely homemade in my blog post to go with this video). Many thank you for sharing this very numerous opinion put up wherein each expert has absolute confidence shared his high-quality knowledge on the subject. Have extra success on your adventure.